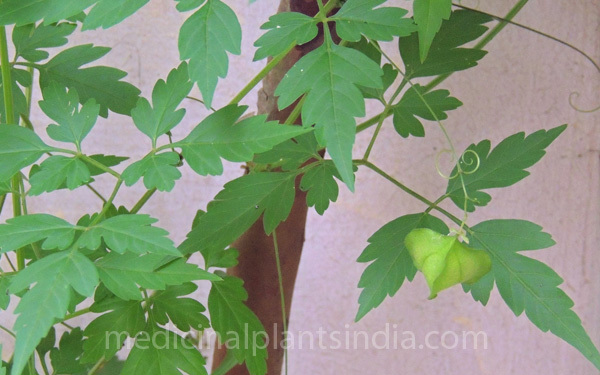 The Scientific name of Balloon Vine: Cardiospermum Helicacabum Linn. love in a puff or balloon Vine is a perennial climbing, herbaceous vine, found as a weed in the roadsides and rivers banks, and plane land ares, it is fast growing and climb with the support of tendrils, up to 10 feet, leaves are yellowish green , lobed and sized 4 inch length, flowers are white and small. The fruit is brown, 3-angled capsule up to 3 cm across, containing 3 black seeds inside. Stomach pain, hip pain, hair falling, inflammation, fever, post delivery care, diarrhea. Anti-Fungal, Anti-viral, Anti diabetic and anti- diarrhea..